Former NBA players Isiah Thomas and Brent Barry shared their thoughts on the current Celtics team on this Tuesday morning's (September 17, 2017) NBATV broadcast prior to the start of the season. Before discussing the Celts, Isiah said that the Cavaliers have gained additional versatility with the addition of Jae Crowder and Jeff Green. He also indicated that Derrick Rose can not be taken lightly. Thomas said that no NBA team wants a weak link that can be exploited, and Rose is no weak link. Brent was high on Coach Brad Stevens inserting Jayson Tatum into the starting lineup. He indicated that putting Tatum into the lineup with some of the games best players, specifically naming Kyrie, Gordon Hayward and Al Horford, would make it easy for Jayson. He won't be nervous. Barry said Tatum plays with poise and will be in the right spots to take his shots. We are not the only ones that love this youngster, Tatum. He has a lot of fans. Bones had some thoughts on the fluidity of Brad lineups, meaning keeping players ready for certain matchups and changing lineups accordingly. He felt this would not happen much in the first 20 games since so many of the players are new and will need time to adjust. Brent had some great insights. Thomas felt the team's identity had changed, from a defensive-first team to an offensive-first one. He said the loss of Avery Bradley and Jae Crowder and the addition of a number of players with offensive skills made the difference. 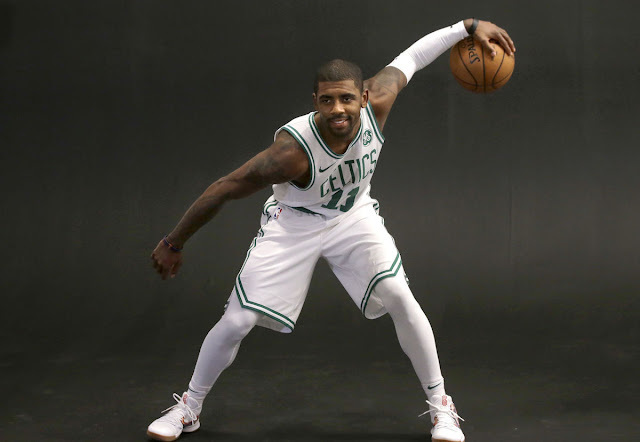 He indicated the Celtics have gone "from gritty to pretty" and that the team needed to find a balance between offense and defense. I personally don't like making comparisons to the Golden State Warriors, but I will here. They play both gritty and pretty. So can Boston. As the Barry/Thomas duo implied, the Celtics have endless combinations of lineups they can employ. The season starts tonight. The two NBATV analysts believe Irving is the key, and I believe Danny Ainge knew that. We shouldn't expect miracles right away. Most of these players are new to the team. Gritty and pretty? Yes, I think, and fairly soon. It's time!